The Salemville Cheese Cooperative is a cheese-making Amish community located in Cambria, Wisconsin. Their cheeses are renowned, nationally and internationally, for their quality, balance and flavor. Amish farmers from this community contribute their milk to each day’s cheese production. The herds range in size from four to twenty-five cows; all are milked twice daily—making for truly happy cows! The Salemville Cooperative is managed, collectively, by an Amish community dedicated to sustainable agriculture. They are equally committed to the quality of their blue cheese, which is best described as beautifully veined, creamy and rich with a deep, almost smoky flavor. 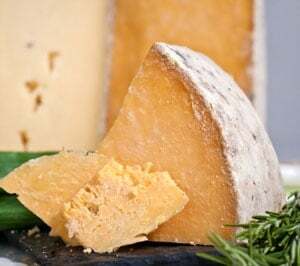 Recent accolades for Salemville Amish Blue include a 1st place win at the 2013 Wisconsin State Fair, a 2nd place showing at the American Cheese Society in 2011, and 2nd place at the 2008 World Cheese Championship. This cheese has a rich, earthy flavor, well balanced and flavorful. Crumble on salad or pasta tossed with garlic and olive oil, stir into hot mashed potatoes or transform a vinaigrette into delicious blue cheese salad dressing by adding Amish Blue to it. (Yes, it’s fine to use a blender). 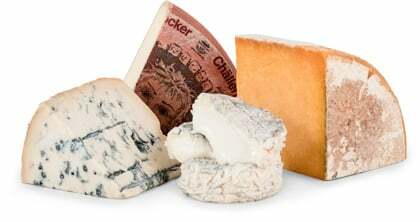 Blue cheeses are good with red wines in general; we recommend cabernet, malbec, pinot noir, and zinfandel.